Looking back, most of my experience with a coffee roaster happens first in a cafe setting before I ever bring a coffee into my house. Usually I'll have a bit of prior knowledge when it comes to the big boys (such as Crescent Moon or Gimme!) or just have an adventurous curiosity when it comes to an unknown roaster, but I'm not usually one to just pick up a bag before sampling it. Thus, it was interesting to learn of a Californian coffee roaster called Weaver's Coffee & Tea through an email correspondence out of the blue that resulted in them sending 2.5 lbs of their various coffees my way. I figured I had just not heard of them prior as they were a smaller company out West and most of my travel is east of the Mississippi, but it turns out (from what I can tell from their website) they don't have any wholesale accounts (yet) and hence no matter how many coffeehouses I would normally hit, I would never have run across Weaver. Upon receiving the coffee, I cracked open the box to find three coffees: The Blend (their signature coffee), an Organic Sumatran, and their Espresso Blend. Usually, I only consume about 1 lb a week at the most so I made sure to kick it into hyper-drive so I could give all three coffees a good run before they became stale. I tried to have each one french pressed but I also managed to have The Blend via drip and iced (brewed strong, chilled, and then served over ice). While the results of the coffees varied, there was one definite consistency; they were all roasted darkly with very noticeable oils on the exterior of the bean. This came to make uber sense as this article explains Weaver was actually a disciple of Alfred Peet, a man renown for his dark roast philosophies. Weaver's coffee offerings online also show all but one roasted "dark", a tell-tale trademark of Alfred Peet. Regarding The Blend, I have to say it was my favorite. It was roasted a bit dark but it profiled with some very bright and fruity flavors; a really decent coffee in any form. The Organic Sumatra fell a bit farther behind, giving off some earthy tones but because of the darkness of the coffee, it was hard to pull anything else out. My least favorite was the Espresso Blend as there was little to garner from it beside the darkness, granted it was roasted to realize it's potential via espresso machine and by the hand of a good barista, so I can only say it didn't do well in a french press. "I have heard of Weaver's Coffee. I actually posted a small bit on them on my 2008 WRBC post. I tried a macchiato at the competition. I actually hadn't heard of them before that. They had some bags of beans out as samples that I stupidly didn't grab. I wasn't wowed by the espresso (they used The Blend), although there was so much good coffee there that it's hard to compare. I would say it was very creamy, smooth and well-balanced; well-constructed, but not particularly distinct. My really limited sense of the company is that they are trying to be a bigger distribution player, but are still pretty new to the scene. They are kind of riding the line between second and third wave coffee (not that I put too much stock in these terms). They don't have a cafe that I'm aware of and I've actually never seen their coffee anywhere other than the WRBC. But this is really just a fast and quick impression." Given the full experience, I feel that Weaver's coffee produces some decent coffees but overall stands as only a moderate contender in the West Coast coffee scene. I would be interested to see where this company goes in the future but for right now, I think they still have a little refining to do. If you manage to find a coffee establishment pulling shots of Weaver's Coffee, give it a try. If you're up for sharing, I'd be curious to hear about it. I happened upon Weaver's a couple of months ago, through a friend's recommendation. Weaver's "The Blend" has since become my "weekend coffee", the coffee I brew when I actually have time to sit & take the time to enjoy. The Blend has always been up to the task. I must admit that I am a dark roast fan. 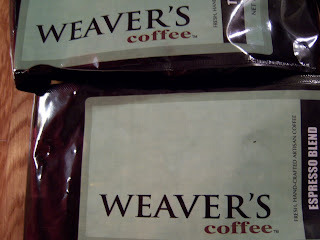 That being said, I find that Weaver's coffee is bright but subtle & complex. I kind of like being in the know with Weaver's, but I hope they continue to gain fans. This coffee deserves to be on every coffee lovers' fav list. I was introduced to Weaver's by a friend. The Blend is definitely my favorite one. I just bought a french Press and try to brew a cup every morning.It is definitely a great cup !